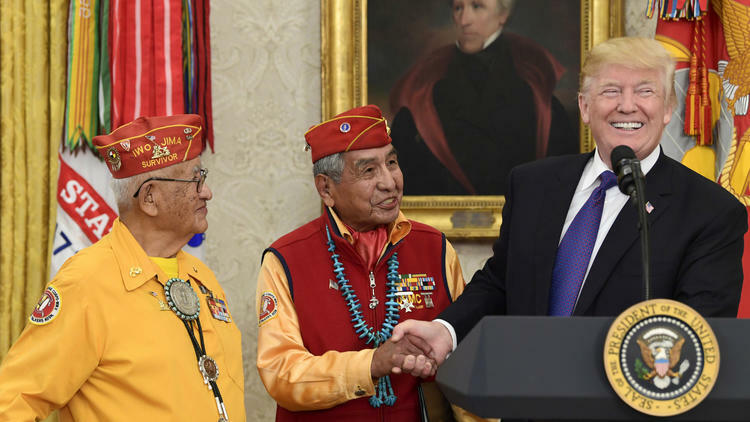 resident Donald Trump returned to his own kind of code talking Monday by deriding Democratic Sen. Elizabeth Warren as “Pocahontas” at a White House event honoring Native American war heroes. But the remark is the latest in a long list of remarks Trump has made about people from specific ethnic and racial groups. Announcing his long shot campaign for president in 2015, Trump said many Mexican immigrants are rapists. He’s sought to ban immigrants from certain Muslim majority nations. He’s come under fire for what some said was a too-slow federal response to hurricane damage in Puerto Rico. Trump also raised eyebrows for apparently having some fun in October with the name of the U.S. territory — “Puerrrto Rico,” he said — at an East Room event for Puerto Ricans.